Having emerged in 2008 with the Bitcoin, Blockchain technology promises to revolutionize digital practices by creating the relationship of trust on which all electronic transactions must, from now on, be based. One can rest assured that establishing this trust improves the user experience and creates value within algorithmic infrastructures. The more complex systems become, the more this trust on the part of the user can be seen as a pre-requisite to any adoption of innovation. The Blockchain should make it possible to spread trust just where it is expected, and to do so in a very natural way. With this ground-breaking technology, the very notions of resilience, reliability, and security are being revisited, based on an extreme redundancy of information, its distribution, and service continuity. No other architecture offers as much resistance to attacks as that of the blockchain. We are indeed witnessing a "revolution" in the way digital data is transmitted and updated, whilst at the same time being certified. As a distributed database, the Blockchain remains accessible to all without any central control. Its method of functioning is that of a large, decentralized accounts ledger on which all the users' accounting balances are recorded, and which is updated by the network itself without any intervention by a central body. The strength of this system rests in its highly spread out mode of governance, with collective verification of the public ledger undertaken by all those who are able to provide computational power (mining). All the transactions undertaken between the users of the Blockchain since its creation can be consulted, but are tamper-proof. The absence of an intermediary means that infrastructure costs are eliminated. The security of the set-up lies in the large number of nodes that make up the chain and ensure a high level of redundancy of the information stored. To hack a Blockchain, you would, in theory, have to take over control of at least half of the whole system's nodes and miners and be equipped with colossal computational power to produce the attack. Such an operation clearly remains out of reach based on current digital capabilities. By providing security and disintermediation, the Blockchain is opening up entirely new opportunities in terms of decentralized architectures. It is impressive to see the extent of its range of applications in the banking sector, finance, insurance, real estate, education, healthcare, the legal professions, and administration in the broader sense. From the regulation and distribution of artistic works, to the fight against illegal downloading or counterfeiting; from the sharing of a medical file to its archiving, the possibilities offered by the Blockchain are highly varied. They always address an expectation by the user, or a structural gap. An often cited example of the use of the Blockchain is in the development of a digital land registry in certain African countries that do not yet have them. That example can be seen as one of the finest applications of this technology, serving the modernization of a State. The Blockchain architecture remains adaptable to any context requiring exchanges of data that are secure, but lack a centralized supervision component. All you need do is adapt the sub-program that implements the protocol for validating the entries within the Blockchain management system. The power of the Blockchain concept goes far beyond the merely technical sphere: it offers a reliable and unprecedented alternative to all protocols for the organization and transmission of information that have, up until now, relied on pyramidal forms of logic. 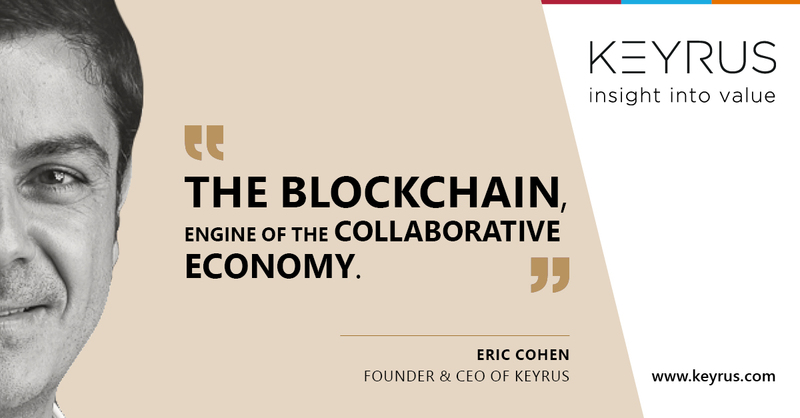 The Blockchain puts into effect the principle of collective intelligence by disseminating the decision-making mechanisms across a network of players. As such, its system for organizing governance is that of a "holacracy", which favors decentralized collaborations. That said, the potential for a Blockchain-based system to bring changes to society continues to depend greatly on whether it is installed on an open, peer-to-peer network. The procedures for the governance of this network and the way it is installed (open or closed network, number of nodes, identity of its operators) are critical to its future capabilities. In an open peer-to-peer network, the greater the number of independent operators spread out on all continents, the more the rules on which the users base their trust will be respected. Trust is born out of the system by reason of the number of nodes it has and their independence, the motivation of its users, and the open nature of the network. This trust "mechanism" differs entirely from that which functions in a traditional system, managed by a single enterprise or a dedicated consortium. The war of the collaborative platforms has begun. It risks being merciless for those who rest on their laurels and are tempted to underestimate the power of the movement. The possibilities opened up by the Blockchain seem limitless. Let us use its architecture to build the foundations of an exponential collaborative economy!